While admittedly well deserved, winter gets a bad rap for the damage the snow, slush, ice, cold and salt can do to your car. But it’s not like the elements in the summer do much good. 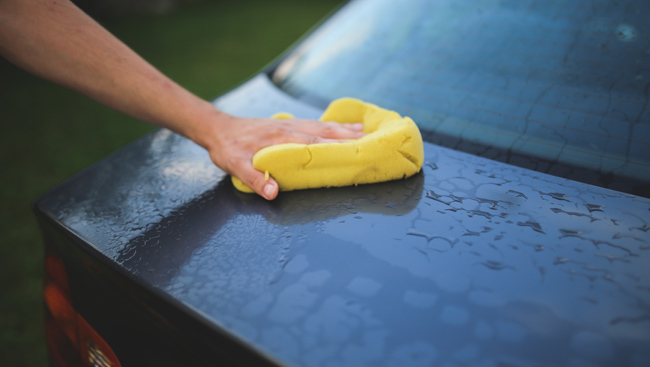 Between the bug splatter on your windshield and the construction dust coming in your open windows, the arrival of the warmer temperatures brings with it new challenges in keeping your car clean. Bugs. You can’t escape them in the summer, and it is obvious they can’t escape the path of your car. Bug splatter encrusts on your windshield for an unsightly mess that won’t wash away using your wipers. A specially formulated bug remover will help clean your car of bugs, tar and bird droppings. Stale air. Sitting in the hot sun all day with the windows rolled up not only heats up the inside of your car – it also makes the air stale. Keep it fresh with an air freshener. Whether you prefer a vent clip or something that hangs from your rearview mirror, an air freshener will help keep your car smelling great. Dusty windows. You can’t see out of a dirty window. Tackle the dirt and grime with a specialized automotive glass cleaner that will restore clarity to your windows. Dusty dashboard. Summer season is akin to construction season. It’s also a great time of year to cruise with your windows down. Unfortunately, the combination of the two can make a mess of your interior. Take care of your dashboard and interior trim with a multi-use auto cleaner, and keep it clean and safe from UV damage with an interior protectant. Brake dust. As bad as winter road salt can look on the body of your car, brake dust can look just as bad on your wheels. A protective spray can prevent brake dust and road grit from sticking to your rims, creating an invisible barrier that keeps your wheels looking clean for weeks. Preserve the shine. It’s one thing to wash your car. It’s another to ensure you properly protect it with a thorough wax job. Wax will provide added protection to your clear coat and paint, protecting it from the sun. Buff your wax coat to a high shine to keep your car sparkling all summer long. If it’s been awhile since you last sat in a brand new car, truck or SUV, you may be amazed to find yourself surrounded by nearly as many buttons, lights and switches as in an airplane cockpit. Mostly controlling devices to keep you safe, what do all the succession of letters that read BLIS, LDW, FCM and so on actually mean? Luckily, here is our guide to new vehicle safety technology giving you a heads up on what exactly is what.